[S961] Everett S. Stackpole, Old Kittery, 305. [S106] NEHGS Register, "Vital Records of York, Maine" (Oct 1962), 116:294, Mr Nathaniel Brooks/Miss Hannah Moulton, int. [S1850] 1850 U.S. Census, York, York, ME, M432_274/210A/414, Nathaniel Brooks. [S1860] 1860 U.S. Census, York, York, ME, M653/451/942, John A. Trafton. [S106] NEHGS Register, "Cemetery Inscriptions at Wells, Maine" (Apr 1939), 93:108. [S1870] 1870 U.S. Census, York, York, ME, M593/565/763, George Brooks. [S1384] Joyce Noonan, citing marriage cert., Job Curtis/Elizabeth Farrar. [S106] NEHGS Register, "Vital Records of York, Maine" (Apr 1965), 119:145. [S961] Everett S. Stackpole, Old Kittery, 305, 306. [S961] Stackpole, Old Kittery, 306. [S106] NEHGS Register, "Records of the South Church of Portsmouth, N.H." (Jul 1928), 82:283. [S1663] Maine Historical and Genealogical Recorder, 3:4:283, "Roll of Men Inlisted into Capt. Tobias Fernald's Company, 30th Regt of Foot, Commanded by Col. James Schamons for the Year 1775." [S1790] 1790 U.S. Census, Kittery, York, ME, M637/2/301, Josiah Brooks. [S1396] Oliver P. Remick, Officers and Men of Kittery and Eliot, 63, Pvt. Josiah Brooks. [S1377] Anderson and Thurston, Vital Records of Kittery, Maine, Prior to 1892, 247, Samuel Brooks/Lydia Staple, int. 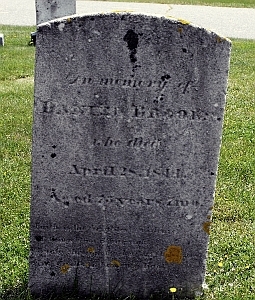 ;176, Samuel Brooks Jr./Lydia Staple m.
Findagrave.com, memorial #84733436. Photo by Bill Paschal. [S1377] Anderson and Thurston, Vital Records of Kittery, Maine, Prior to 1892, 182, Daniel Brooks/Molly Spinney m.; 249, Danniel Brooks/Molly Spinney, int. [S148] FindAGrave.com, memorials #84733436, #84733377. [S1626] Joan Gerrish, citing Mt. Pleasant/Greenwood Cemetery records, 22. [S1850] 1850 U.S. Census, Eliot, York, ME, M432/274/236, Abraham Brooks. [S1860] 1860 U.S. Census, Eliot, York, ME, M653/450/22, Abram Brooks. Findagrave.com, memorial #84733377. Photo by Bill Paschal. [S961] Everett S. Stackpole, Old Kittery, 306. [S1377] Anderson and Thurston, Vital Records of Kittery, Maine, Prior to 1892, 255, Giddeon Brooks/Betsy Haven, int. [S961] Stackpole, Old Kittery, 305, 306. [S1850] 1850 U.S. Census, Eliot, York, ME, M432/274/237, Gideon Brooks. [S961] Stackpole, Old Kittery, 305-06. [S961] Stackpole, Old Kittery, 305-06: 27 Jul 1809. [S1377] Anderson and Thurston, Vital Records of Kittery, Maine, Prior to 1892, 265, William Brooks Jr./Polly Hammond, int. 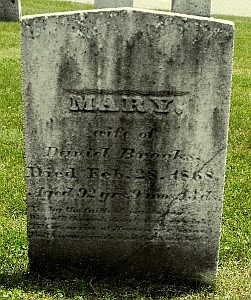 ; 199, William Brooks/Polly Hammond m.
[S1850] 1850 U.S. Census, Eliot, York, ME, M432/274/240B, Mary Brooks.